It's a rainy day today! April rain and May flowers! The leaves are changing colors! What were they doing after lunch? T.G.I.F. (Thank Goodness It's Friday)!!! End of the school year--the speech contest and graduation!!! FINALLY, its here, THE SPEECH CONTEST! It's March!!! It's March...means spring!!! THANK GOODNESS IT'S FRIDAY or TGIF! Hope everyone is having a good Friday and will have a good weekend. Today I was very surprised and happy that 3 of the students, during playtime, after lunch, were speaking together in English. It was very good to hear and I hope more of our preschool students will be able to have conversations in English as well. Also, for this month, the monthly theme is "jungle and forest animals" and we have been singing a hippopotamus song. So, here is an American kids program about creatures in the wild, called the "Wild Kratts." You can learn about different animals, so please enjoy. Wow, its already November....and its getting real cold--soon winter!!! Time flies, unbelievable. 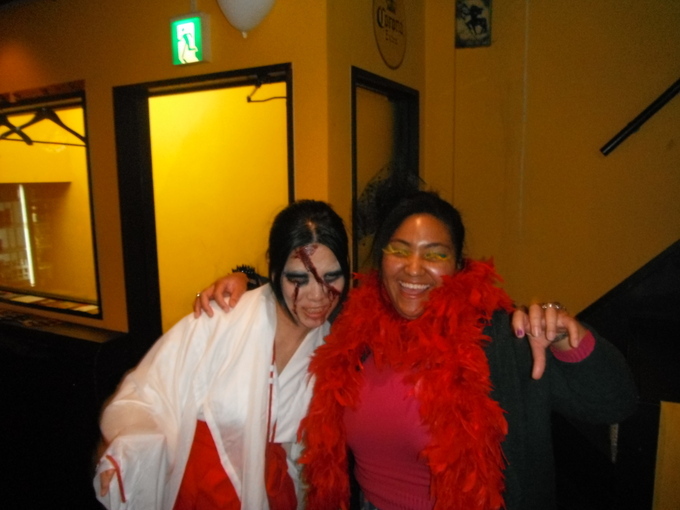 Well, if you didn't realize, Halloween was actually on October 31st, and I actually dressed up--well half dressed up--but on the actual weekend before Halloween, October 27th, the city of Shinsaibashi had a whole lotta events for us Halloween lovers. 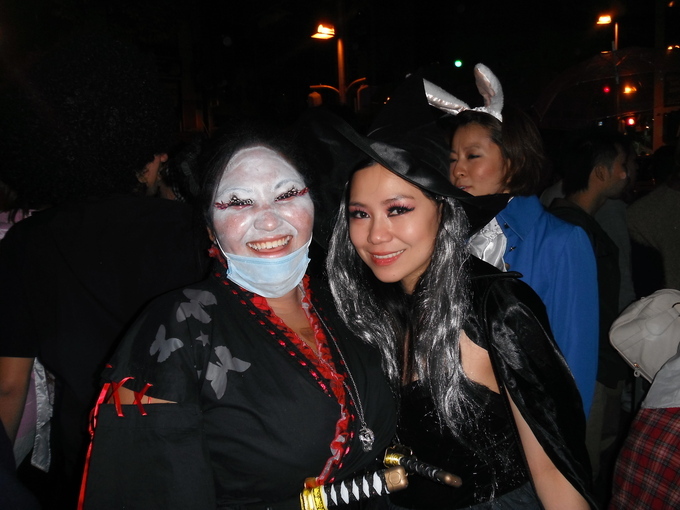 I believe I was a "zombie ninja" and I ran into a witch who looks much like Ai teacher. 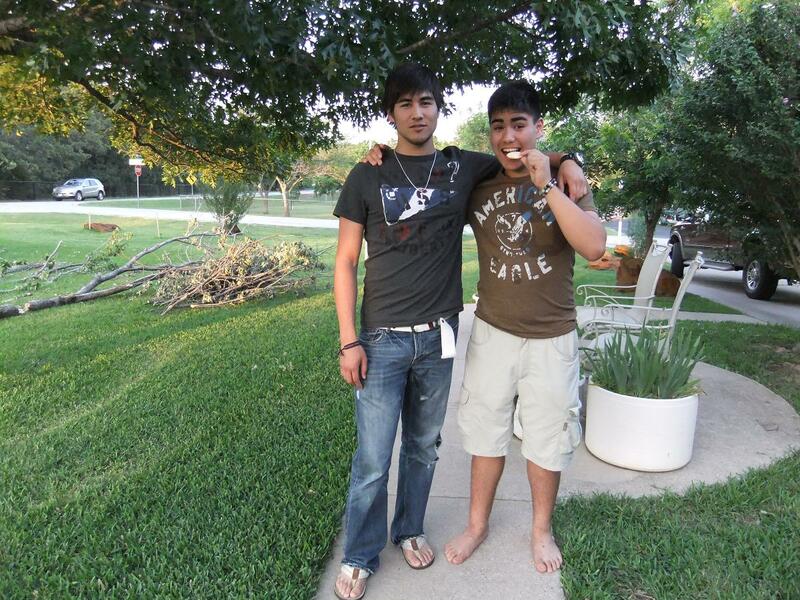 Can you recognize us? 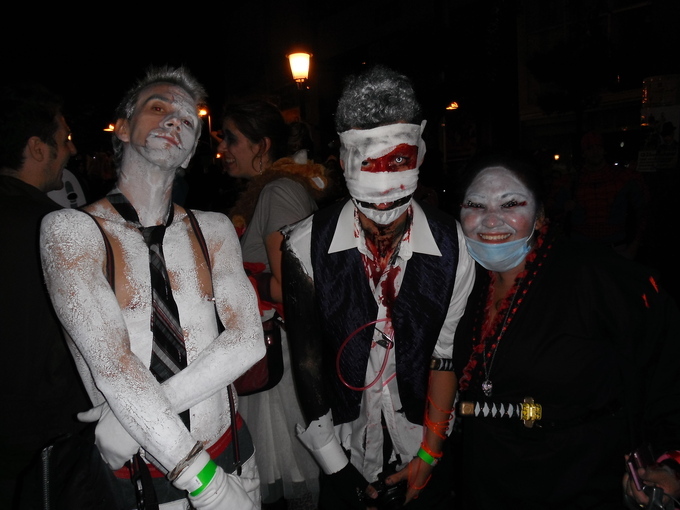 So, like i promised, here are some photos of Halloween with me and my friends. And I'm sad its all over and have to wait another year....I wonder what I'll be??? The Halloween party last weekend was a total success. We at Kid's Smile would like to thank everyone who participated and joined us from the bottom of our hearts. So today is Halloween for the rest of us. 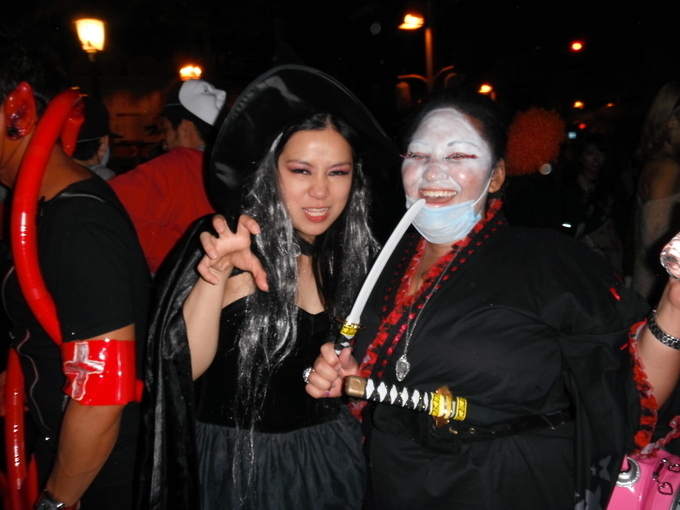 If you live in Minami of Osaka you are probably familiar with the Big Annual Halloween Cosplay that happens at Triangle Park. I, myself will go there tonight in a costume that I haven't figured out yet. Uh-oh! 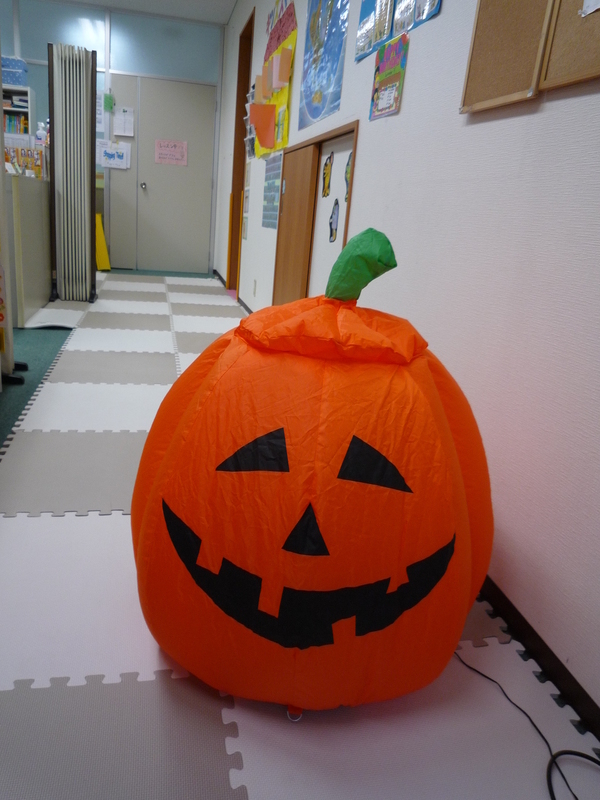 Well, last week Saturday was Kids Smile International School's Halloween party, and sounds like everyone had a good time--which, of course, I'm very glad to hear. I also had a good time, and I think it's getting better every year. Well done Kids Smile students--give yourself a nice pat on the back! So, I'm expecting next year's one to be even more spectacular. But, if you didn't know, Halloween is actually on the 31st of October and I shall be dressing up (in costume) for this on the weekend. Any guesses as to what I will be this Halloween??? Guess, you guys are gonna have to wait till next week Friday...when I may post some pictures of me in costume. So, don't forget: "Trick-or-treat, give me something good to eat...."
Hope everyone has a ghoulish and frightful Friday! TGIF!!! 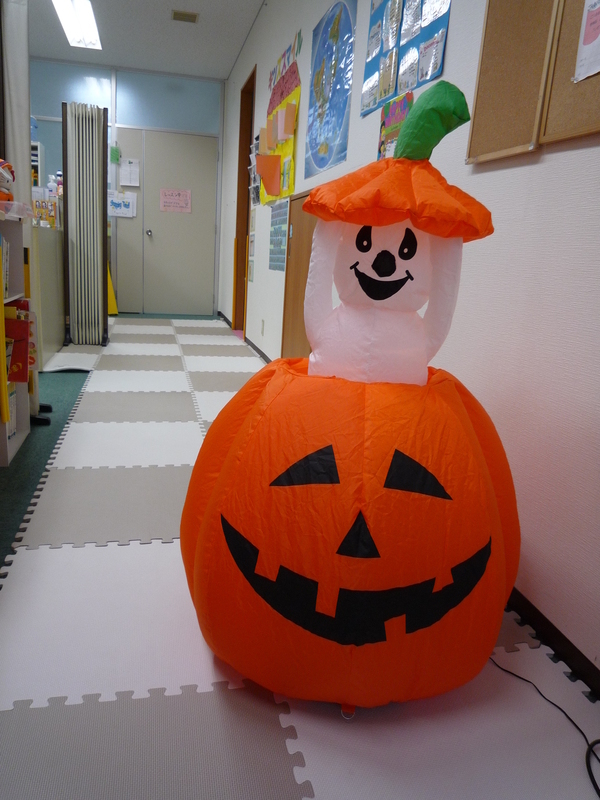 The party of the year is here--Kids Smile Halloween Party! The big day has finally arrived, with all the students practicing hard to remember their lines and dance moves. I can't wait to see everyone in their costumes. The preschool students are looking good and I can't wait to see everyone on stage, in costume, dancing. I hope all of you will be ready tomorrow. Hope you guys remember your dance and lines for the party tomorrow. Looking forward to seeing you guys. So, get rest and lets have a great little party tomorrow. Good afternoon everyone! It's TGIF--remember, thank goodness it's friday! Well, today is about the humuhumunukunukuapua'a--if you can pronounce this correctly, you should give yourself a pat on the back. So, what is it you ask? People say, it's a long name for such a small fish. That's right, its a fish, the Hawai'i state fish otherwise known as humuhumu for short, or rectangular reef triggerfish. It is the longest word in the Hawaiian language. Its meaning in Hawaiian: "the fish that snorts like a pig" or as "the fish that has a snout like a pig." It is said that when caught or scared away, and hides into a corner, it makes a snort like a pig. I sometimes have said this in the preschool class, hard to pronounce, but if you hear your children saying something strange and long, it maybe this word. This is a music video about the humuhumu from some Hawaii artists named Leon and Malia.